A few months back, I was on a photo trip up north in the Pacific Northwest and it was incredible. I’m sure you’ve already heard me gush enough about it. Anyhow, our hosts were friends of the guy that hired me, who not only graciously allowed us to commandeer their home for a week, but also one of their cars. They were some of the warmest, most hospitable people I’ve ever met and it was incredible how they were immediately able to diffuse any anxieties about staying with strangers. One night after a string of a particularly long few days of shooting out in the field - the stunning forests and mountains landscapes and waterways of Washington and Oregon - we decided to take an afternoon off, take ‘er easy and hang out at the house with the hosts that took us in. Because we were there earlier than usual that afternoon, we got to spend some quality time not only with the host couple, but their gorgeous 3-year old daughter. We watched bits of "Frozen" (over and over and over and over and over again…), we sang songs, and, not surprisingly, we got silly with the camera. 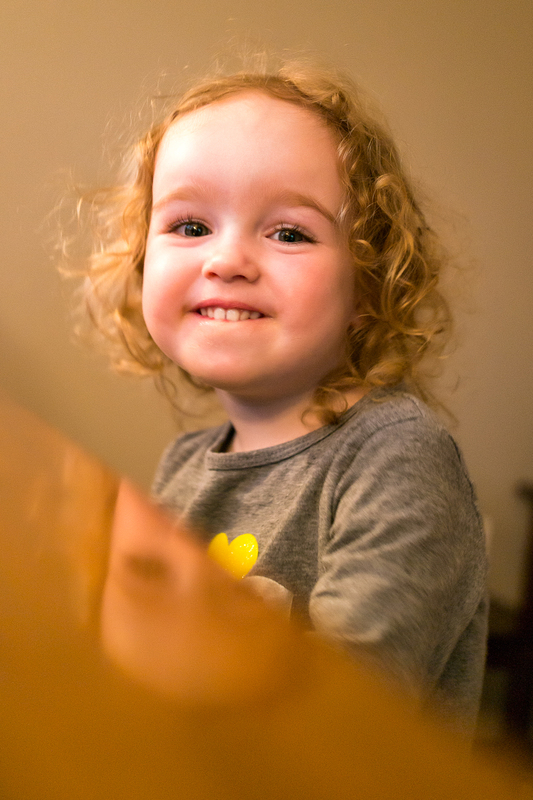 While she was shy at first, it didn’t take much to warm her up to the lens (when in doubt, always revert to the Frozen soundtrack…over and over and over and over again…). Anyhow, through this process and impromptu baby photography session, I managed to snap a few images I found completely adorable. Later on that evening as the family stuffs was winding down, I found some time to sit and process images from the day, and instead of the job we were there for, I decided to process a few of the images of their daughter. After I got 3 or 4 of them I was happy with, I posted them on Facebook to the parents’ pages and emailed them high resolution copies, and when they saw them, they damn near melted. It was beautiful. It instantly added another level of human connection, warmth, and appreciation to the relationship. A small spontaneous gesture can go a long long way. To me, it was nothing, I love making images, so when there’s a compelling subject in front of me, I can’t help it. Whether or not I was ever able to share those images with anyone was besides the fact, I just simply enjoy the process of making a simple photograph. But in some situations more than others, you are reminded of what a raw, engaging, emotional gift a ‘simple’ photograph can be. While many other artistic mediums all have their merits and their strengths, many, I might add, of which I'm particularly envious of, photography remains the only one, practically by definition, in which it is even remotely possible to capture an eternal visual reminder of a single moment. One that you shared with someone else. when there was nothing else.